Casa Nonna Netta is located on the 1st floor of a modern building with parking space in a quiet place in the center of Sorrento. It is supplied with elevator suitable for the disabled too. Casa Nonna Netta is composed of a wide living room with a dining-table and chairs: an additional single bed can be placed there in case of need. The equipped kitchen is independent, but very close to the living/dining room . The sleeping area consists of a double bedroom, a twin bedroom + the third single bed, served by a bathroom with shower. 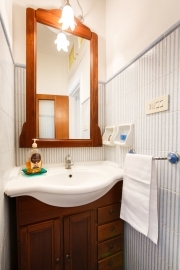 Casa Nonna Netta is equipped with air-conditioning/heating, washing machine, TV, refrigerator, and has a small terrace equipped with table and chairs. Allergy Prevention: The filters of air conditioners are kept constantly clean. Moreover, the paint used on the walls of the apartment is anti-toxic and non-allergenic. CITY TAX 3€ PER PERSON PER NIGHT (underage excluded). This fee is applicable for a maximum of 7 consecutive nights.